When I was growing up these crunchy, chocolatey, peanutty, biscuits were my sister’s favourite. She used to make them with our mum and they always filled the house with a gorgeous smell as they were cooking! With her birthday approaching, I thought it would be lovely to make a batch as part of her present, but our mum is on holiday so I couldn’t check the recipe out with her… Internet to the rescue! I was completely convinced that if I put peanut brownie biscuits into a search engine, it would return nothing but recipes for the cake style brownie… but how wrong I was! It turns out that they’re a well loved New Zealand biscuit, and the basic recipe seemed pretty standard. But, it used eggs, butter, and of course wheat flour. So I set about experimenting… the first batch was basically cake, due I think, to a heavy hand with the soy milk. They were also too pale and not chocolatey enough! The second batch had the correct colour and flavour, but I have it on good authority that one could be held in tea for an entire minute, with no discernible disintegration (thank you Alex…). 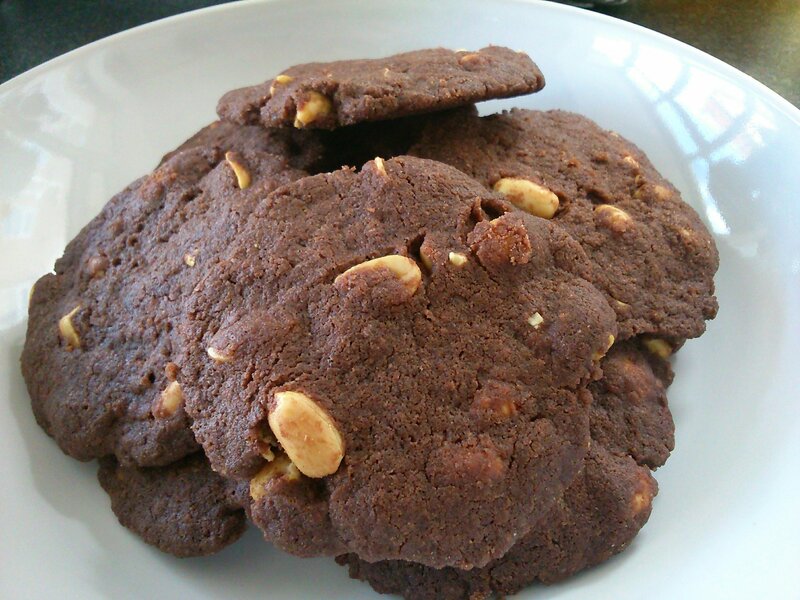 Peanut brownie biscuits – yum! Line 2 large trays with baking paper and preheat the oven to 190 degrees c.
Mix the sugar, flour, cocoa powder and baking powder together in a large bowl. Rub in the fat until well combined, and then add the peanuts and mix them in thoroughly. Add the soy milk and bring the mixture together into a dough. Roll the dough into 20 balls, mine were between 30 and 35 g each. Squash each ball gently in your palm to make a flattish biscuit, they will spread a tiny bit in the oven, but really not much. Place the biscuits on the trays and bake for 15 – 18 minutes. The biscuits will be soft when they come out of the oven, so cool them on the trays.